It’s October which means football is in full swing. We live in the South which means we celebrate the four seasons; Winter, Spring, Summer, and FOOTBALL. In my house, Saturday is dedicated to College Football and Sunday is dedicated to the Pro games. We watch every Carolina Panthers game and I am proud to say we’ve had a strong season so far. 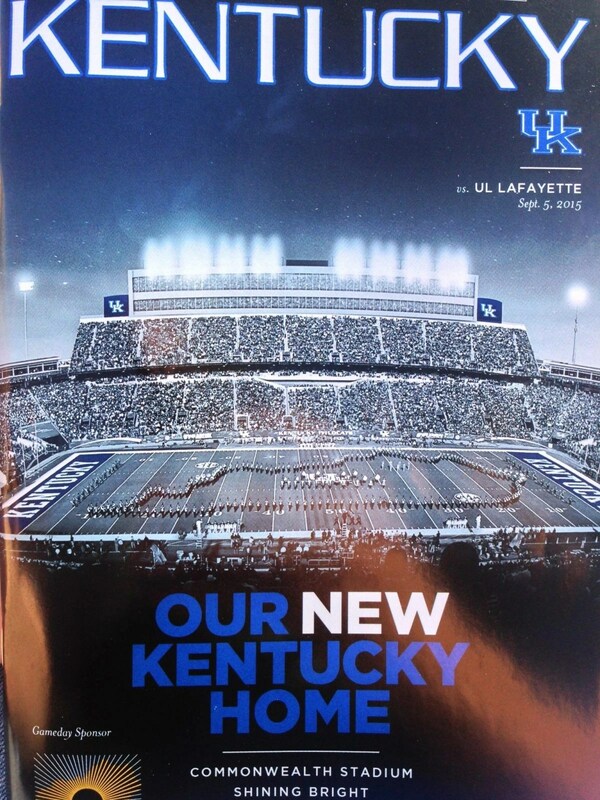 University of Kentucky Wildcats Football Program Booklet for season opener against UL Lafayette – Sept. 5, 2015. Disclaimer: I was not compensated or given anything free by UK or anyone else to facilitate this post. My family attended this game at our own expense because we are UK fans. This post is comprised solely of my opinions about UK football and the game we attended. Any offense taken by fans of other SEC teams is not intended and should not be inferred as such. I am a Wildcat fan, but I respect all other college football teams, as well. College football is back, baby! My husband, three children and I attended the first game in the newly renovated Commonwealth Stadium at the University of Kentucky campus in Lexington, KY. You can check out all things UK at ukathletics.com. For all things Kentucky sports, check out KSR (Kentucky Sports Radio). My husband is always listening to Matt Jones radio show on KSR. I don’t seek out the show but do listen when the hubby has it on. We are dedicated Big Blue fans in our house. And with the excitement for this season of college football verging on palpable in Kentucky, this was a great opportunity to take a day trip with the family, tailgate and listen to pre-game shows on the radio, and get a look at the improvements made to the stadium since last season.